Today’s card is one of the cards that I mentioned previously that I had made before I gave birth but hadn’t gotten around to posting. For this card I went with using circles and stars, which is what I tend to use for male cards. I used the Spellbinders Nestabilities circles and cut and emboss the circles and used the sizzix stars in different sizes. For the sentiment, I used the Clearly Besotted Tag along stamp and stamped it on one of the circles and added stars to the other circles. The background paper is quite bright orange so I decided to use some kraft card behind it and some more muted patterned paper for the circles. 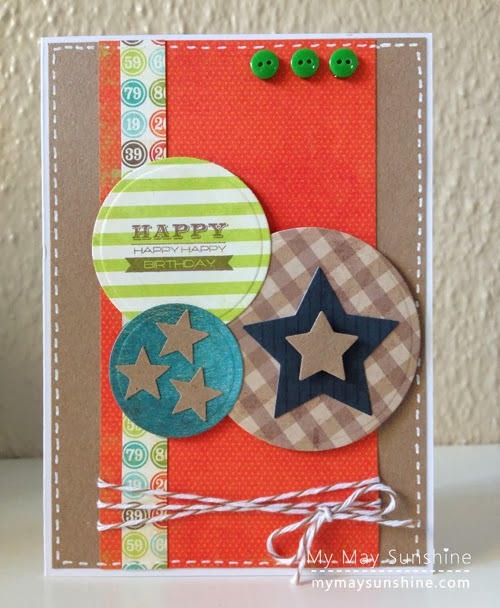 Paper – Basic Grey | Stamp – Clearly Besotted Tag Along | Circles – Spelbinders Nestabilities circles large | Stars – Sizzix | Twine – | Buttons – Papermania.